It might feel as though we’ve been thinking about – and talking about – Mifid II and its potential to affect corporate access, equity research and sell-side coverage forever. It might also feel as though the oft-discussed shrinking of the sell side is the direct result of the mammoth European regulation. But this conversation is nothing new. 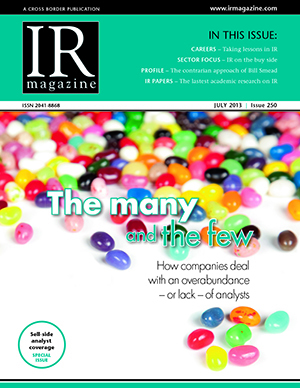 Back in July 2013, Brad Allen’s IR Magazine cover story The many and the few looked at how companies cope with what they see as thin coverage and how those in the rather luxurious position of feeling like they have too much coverage cope with the attention. In 2013, research by IR Magazine found that a quarter of IROs felt they had too many analysts covering their stock, while a quarter said the opposite. Kris Wenker, IRO at mega-cap food giant General Mills, observed at the time that of the 20 analysts submitting estimates on her company to First Call, there was a handful who merely went through the motions. ‘I see no evidence of an active effort (by those analysts) to monitor company performance or publish substantive analysis or research,’ she said. Among the IR professionals on the ‘too many analysts’ side of the table, a variety of voices were heard. Some said the numbers worked in their favor even if it meant more work for the IR team, while others noted that rather than a high level of coverage, what they were looking for was a different quality of coverage. The other side of the story is the too few, though – and that’s a far harder position to be in. But even if an analyst finds limited revenue in covering a particular firm, a case for coverage can still be made. Dennis Walsh, then vice president at Boston-based IR consultants Sharon Merrill Associates and now director of IR at Zillow, advised clients at the time to give a targeted analyst ‘a compelling reason’ to pick up coverage. ‘Make the case that covering your company will help the analyst to better understand the market drivers that affect the larger businesses he or she covers,’ he said. He also urged under-covered firms to be aggressive, mounting their own company-sponsored non-deal roadshows ‘at least once a quarter’ and soliciting invitations from non-covering analysts to present at their conferences, both to build relationships with target analysts and to demonstrate interest in the company among the analyst’s buy-side clients. More difficult is the ‘vicious cycle’ that Walsh said creates low trading volume. ‘The buy side avoids low-volume stocks because it cannot easily get out [of them] and the sell side isn’t interested’ because of low trading commissions, he explained. Which brings us back to Mifid II and the unbundling of commissions and research (among much else). The general consensus has long been that the regulation will result in further sell-side shrinkage – particularly for small-cap companies, which are also expected to see a resulting drop in research. As far back as 2014, the UK’s IR Society warned that the proposed rules around dealing commissions and corporate access would hit small caps hardest, while this year Ed Beal, senior investment manager at Aberdeen Asset Management, advised small caps not to over-rely on the sell side. But Mifid II is not all doom and gloom. While much of the conversation remains of the ‘wait and see’ variety and there continue to be familiar warnings, Jonathan Paterson, managing partner at IR and corporate access specialist Harbor Access, took a more positive view as the regulation came in at the start of this year. ‘In the new legislative environment, our hope is that the sell side will look at companies in more detail before initiating coverage, and produce better research materials. A higher quality of research will make the job of investor relations easier – especially in terms of managing investor expectations,’ he predicted on January 3, 2018: D-Day for Mifid II.